The Admiral's House, formally the Ilfracombe Manor House, is situated at the edge of Ilfracombe's Harbour and consists of five beautifully converted apartments named after famous Admirals - Jellicoe, Nelson, Exmouth, Hornblower and Fisher. 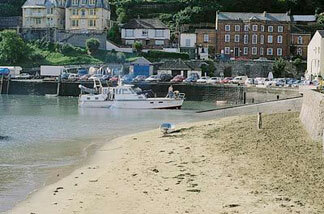 All the apartments have splendid views over Ilfracombe's Heritage Harbour. They are adjacent to the picturesque quay giving easy access to the restaurants, cafes/bars, nautical attractions and activities. All holiday properties have fitted kitchens with microwaves, cookers and fridges; television (with Freeview), DVD Players: C.D. player and radio alarm clocks; irons and ironing boards; duvets and linen; towels and tea towels; full heating; cot and high chair available; games and books. To the rear of the Admirals house is a steep rustic and rambling communal garden with fabulous viewpoints from the lawn summit. There are patio suntraps and picnic areas for use by all guests. Also available for all apartments is a utility area, with a washing machine and tumble dryer. 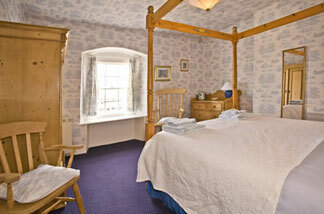 All the accommodation is self catering and open all year. These are strictly no smoking properties. The picturesque town grew around a tiny fishing village but the Admiral's House has commanded its position over the sheltered port since 1720. Originally the Manor House, the site dates from Norman days and has been held at different times by the Champernounes, Martyns, Greys, Sir Philip Sydney, Audleys and the Bourchier Wrey family. The listed Georgian house occupies the site once dominated by Ilfracombe's ancient castle and, in the recent conversion and loving refurbishment, an underground passage has been discovered which led from the quay to the castle. Jellicoe is a spacious split level one bedroom apartment with open plan living/dining area plus modern galley kitchen downstairs. The bathroom (with bath and over bath shower) and double bedroom (with four-poster bed) upstairs. Views of the harbour from both lounge and bedroom. Suggested max: - 2 persons + dog welcome. Nelson is a two-bedroom ground floor apartment with its own private patio with dining area. Comfortably furnished, the spacious lounge has large bay windows with excellent harbour views plus a separate fitted kitchen and bathroom with a bath and over-bath shower. 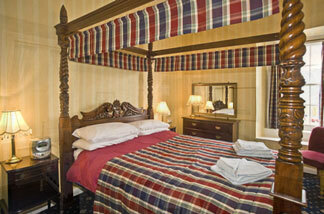 The master bedroom has a four poster bed and the second bedroom has twin beds. 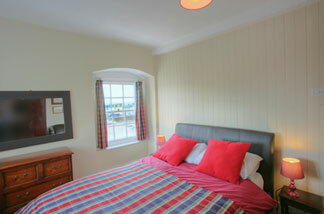 Both bedrooms have a view of the harbour. Exmouth is a two-bedroom 1st floor apartment, It offers superb views of the harbour through its large bay windows which have the original working wooden shutters. There is a separate kitchen, dining area and bathroom with bath and over bath shower. 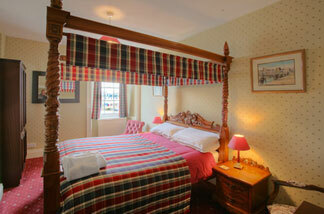 The master bedroom has a four poster bed and the second bedroom has twin beds both with views of the harbour. This apartment has access to a private patio with garden furniture which leads to the shared terraced garden. 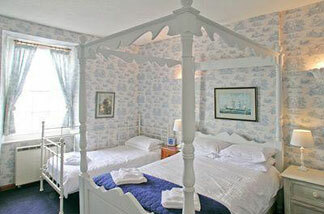 Hornblower is a 2nd floor, two-bedroom apartment with views of the harbour and right out to sea. It has a large lounge with bay windows seats and dining area plus modern galley kitchen, bathroom with bath and over bath shower. The master bedroom has a four poster double bed and the second bedroom has twin beds (this room is quite small and would probably be more suitable for children). Both have views over the harbour area. The communal garden is also accessed from the 2nd floor. At the top of the house, Fisher is a one bedroom apartment with open plan lounge/dining area. With stunning views of the harbour and right out to sea, Fisher also has a lovely view of the garden which is accessed from this level. The bedroom has a double bed. It has a fitted kitchen and bathroom with bath and over bath shower. Although we feature on various internet booking portals, for the best deals and availability please contact us directly. All accommodation is available from 3pm on the day of arrival to 10am on the day of departure. A non-refundable booking deposit of 25% is required when making a reservation. The balance of 75% is payable 6wks prior to arrival. Payments to be made by BACS - details will be emailed to you once your booking has been confirmed. A £100 fully refundable security deposit is required before arrival. Any breakages, loss or damage to the premises, fixtures or contents must be paid for. No properties may be used for sleeping more persons than indicated to the proprietors at the time of booking. Please leave apartments in a clean condition on departure.